In an ominous sign for Representative Charles B. Rangel, the House ethics committee on Monday said the facts presented by a prosecutor accusing Mr. Rangel of violating Congressional rules were not in dispute and that the congressman himself had not refuted the charges. The committee’s finding came after an unusual public hearing that was abbreviated by the longtime congressman’s dramatic exit from the proceedings. Mr. Rangel, who appeared at the inquiry alone, stunned the packed hearing room by walking out after complaining that he had no lawyer because he could not afford the millions of dollars in legal fees he had racked up during the two-year investigation. After declaring that “I respectfully withdraw from these proceedings,” Mr. Rangel shook hands with the lawyers for the ethics committee who were preparing to lay out the case against him and strode steadily out of the room. But after meeting privately, committee members resumed the proceedings without Mr. Rangel, a Democrat who has represented Harlem for four decades. 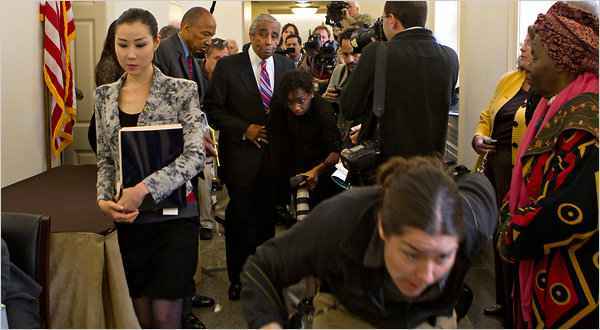 In a rebuke to Mr. Rangel, members noted that he had been advised repeatedly, starting as early as September 2008, that he was well within his rights to set up a defense fund to raise money for his legal expenses. Mr. Rangel and his defense team from the firm Zuckerman Spaeder parted ways several weeks ago.